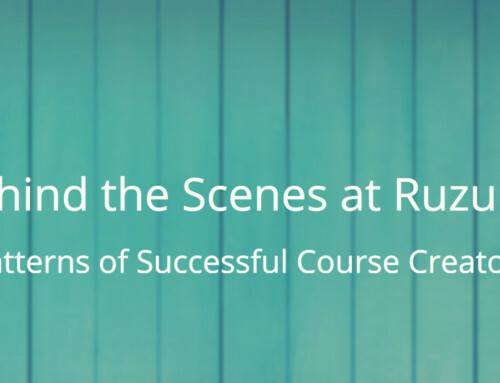 Last week’s post tackled a massive topic — how to create a course that your audience will love. And in that post, we referenced a survey that showed some of the biggest challenges facing anyone who wants to create an online course. 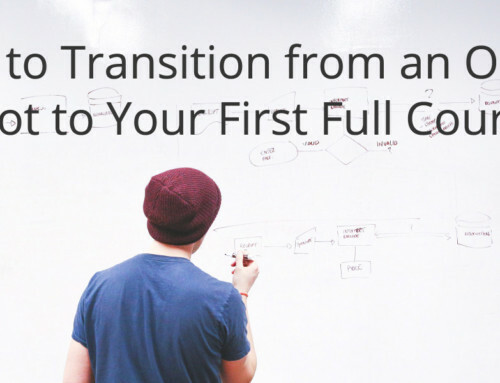 Turns out, actually creating a course isn’t the hardest part of the process. In fact, once you buckle down and get to work, the course creation is actually kind of fun. Our guess is that this particular realization is why a large number of courses end up never seeing the light of day. Before you know it, the course becomes yet another metaphorical paperweight holding down the scattered bits of their business. But we think there’s a better way. That’s why I sat down with team members Abe, Rick, and Felicity to have a discussion around the challenges facing you as you market your course, and what we at Ruzuku can do to help solve those challenges. In each section, you’ll see direct quotes from the survey, followed by the solutions we’re offering for those problems. What we discussed might surprise you. Why is marketing a course so hard, and why does it feel scary and downright awful when it comes time to sell your course? When you say that marketing is hard, or unpleasant, or distasteful — it’s just a story that you tell yourself. And when you internalize those stories, you make the entire process harder than it has to be. Noah’s approach is a bit of an oversimplification, but he has a point. People get stuck because they’re trying to fix the wrong thing, or they haven’t created what people want. So what would happen if we looked at marketing in a different way? What if we flipped the story and told ourselves that marketing is easy and fun? That instead of being awful, it’s a generous process where you get to make a massive contribution to your audience? We find that people really do care about their audience — they want to help them solve their trickiest problems, and to help make their lives better. What we often forget is that marketing is a natural part of that process. It’s what you need to do before you get people into your course: to connect and share with them, and to just generally make things more awesome for them. Your first step is to change the story in your mind. Go ahead — say it out loud. With a smile on your face. The solution is not to push yourself harder to do it better. It’s to look at it differently. Change the story you’re telling yourself about marketing. Then, once you’ve changed up your internal monologue, your next step is to get to know your audience. Maybe you think customer research could become a never-ending task, and since it may not feel like the most fun thing you could be doing, sometimes (more often than we’d like to admit) it gets relegated to the “I’ll do that later, when I have more time” list. But here’s the truth. Doing customer research doesn’t have to be dull. Really, it’s a wonderful opportunity to be of service. 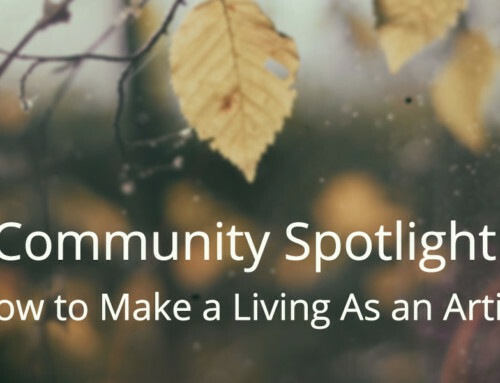 It’s a chance to connect with people that you can help, and might even give you the opportunity to make their lives a little better in the process (maybe by giving them one small tip or helping them to do one simple thing that makes their lives easier). And we’ll let you in on a little secret: making sure that you really know your audience and that you’re solving a problem that’s impacting their lives — that’s what makes marketing easier. Suddenly you’re not just trying to “sell” them on something. You’re doing something that’s going to solve a problem for them, to improve their lives. Ramit Sethi shows us how selling courses begins with solving a burning pain point, not worrying about any of the other parts of the process until it’s time. With a little bit of mental shifting, you can move beyond these psychological roadblocks to marketing success. Then, your next step starts with making sure that you and your audience understand each other. It’s something that veteran marketers do without even thinking about it — stepping into the shoes of their audience, finding just the right words, and speaking in a language that hooks with the first sentence. The problem comes when you try to mimic these marketers and you don’t actually know your audience that well yet. Yes, you could use the exact same sales page and copywriting that Ramit uses, but chances are it won’t work for YOUR audience. Felicity reminds us that another stumbling block comes when you talk over the head of your audience, using teacher-speak or marketer-speak. Using big words and industry jargon may make you feel like you’re a pro, but if your audience doesn’t understand (and empathize with) what you’re telling them, you’re basically done before you even get started. 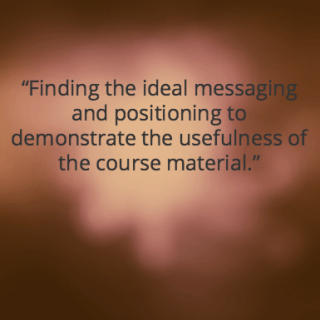 The solution to finding the “ideal messaging and positioning” for your course is a simple one — listen to your audience. They’ll tell you exactly what their problem is, and when you can explain the solution (your course) in their language, you won’t need to “demonstrate the usefulness” of your course. Developing empathy toward your audience is so incredibly important, and yet so many people skimp on this step (or completely skip it). And unfortunately, it’s also leading to shallower tactical approaches to marketing, where people are just going through the motions instead of developing deep empathy and understanding their audience’s point of view — and making their marketing efforts much more difficult than they should be. Instead, let’s talk about an approach to connecting with your audience so that you can really understand where they’re coming from. Again, the solution to this challenge is simple, once you know what to do. The way to solve this challenge is to connect deeply with your audience. They will tell you what the “right” topic is, guide you toward delivering it in a way that works for them, and basically eliminate the need for traditional marketing efforts. It may sound too good to be true — but it’s really not. The real reason more people aren’t doing this is because it’s a lot of work! Connecting with your audience is a lot like starting up a friendship. You need to spend enough time “with” your audience so that you really get to know them (and they to get to know you). It starts with figuring out where they spend time online, reading their comments, and doing your problem language research (like we talked about in last week’s post). In an ideal world, you want to eventually know your audience better than they know themselves. You want to know what keeps them awake at 2 am, and what problems are making their lives miserable. And yes, this takes quite a bit of time. But trust us when we tell you that the time learning all about your audience is time well spent, and will actually save you time in the long run. If you’ve already built a community, that’s your first (and usually best) place to gather data. You can scour the comments on your blog as well as any data you have from previous courses, and you can directly email your list to ask people about the challenges that they’re facing (remember to send a personal reply back when they do respond). For example, as Ruzuku was getting started, Abe took all of the comments from our “5 Steps to Your Online Course” program and broke them down into themes around major challenges and pain points, and used that data to guide what the company was offering. But not everyone has access to a built-in audience. Chances are, you may be at the beginning of your journey. Fear not — you can also connect with your future audience! If you’re just getting started, you can use guerrilla tactics, doing research on third-party platforms and other places where you know your audience spends time and engages. This is a good way to get started, but shouldn’t be the only research that you do. One of the most effective ways to research as you’re getting started is to use your personal network to find any connections you have to people who are having the problem you want to solve, and have a one-on-one conversation with them. It can feel paralyzing to get people on the phone, but these person to person conversations are some of the most valuable research that you can do. Not only do you get to ask questions, but you also have the opportunity to ask “why” and to dig deeper, to get to the root of their problems instead of just scratching the surface. Or, if you know people locally, ask them if you can invite them out for a cup of coffee and a short chat to pick their brains. What if it all feels like too much? Sometimes, even when you know you have something great to offer, it can feel really intimidating to reach out and make those first connections — whether you have an audience or not, sometimes our psychology can get in the way of forward progress! We get it. It’s the first time that you’re putting your idea in front of actual people… who might very well reject what you’re offering. And yes it’s scary, but if you reframe how you’re looking at it, it’s even more alarming that you’d consider keeping a solution to their urgent problem to yourself, and to let them keep suffering alone! Want it to get easier? Just do it. You might start by breaking down the process into small, specific, and actionable steps. Today, I’m going to send this email asking to talk to them. Tomorrow, I’m going to prepare some questions to ask during our conversation. Next week, I’m going to reach out to them again if I haven’t heard back. See? Small, simple steps that you can easily check off your list. You might use a software like Appointlet to make the scheduling itself easier, blocking off 20, 30 or 60 minute chunks of time to talk to people about the problems they’re having. When you break through the resistance and make that first contact, celebrate the victory! Give yourself positive reinforcement, and celebrate the hard steps you take along the way, whether they’re big or small. This way, we train our subconscious that it’s going to get rewarded for doing the things we tell it to do. Rick strongly believes that the best skill you can develop is active listening. But what is active listening? The simple definition involves really listening so that you hear and understand what the other person is saying (rather than thinking about your response while they’re talking), reflecting back what the other person has expressed, and checking your understanding of what they’re saying. You’ll want to ask questions and show interest in what the person is saying, but don’t try to control or guide the conversation in the direction you want it to go, otherwise you might miss some of the most important parts of the exchange. Something else that can help you really listen is to ask if you can record the conversation. That way, you know that if you miss anything, you can go back and listen to the conversation again — this allows you to be fully present for the conversation as it’s happening. There’s no secret formula to make reaching out less scary, but it might make it easier if you remember that there’s usually at least one small nugget of gold inside each conversation you have, and you might even hit the jackpot with an entire conversation. And — you won’t find the special sauce that will set you apart from everyone else in your market unless you sit down and connect with your audience! There’s magic in the conversation. The path starts with understanding your audience and their needs. You humble yourself, and start every conversation with a beginner’s mind. You get good at active listening, ask what they think using probing questions, and really listen to the words that they’re using. When you walk away from the conversation, you have a lot of information. It may not all be directly relevant, but you’ll suddenly understand the whole person whose problem you are solving with your course. And there’s no substitute for taking your own journey. You can watch others take their journeys, read all about it, or mimic those who have gone before. You’ll certainly learn something along the way, but there’s nothing that compares to embarking upon the path for yourself. So, we’re ready to mark this myth about marketing being a course creator’s #1 challenge “busted” — do you agree? 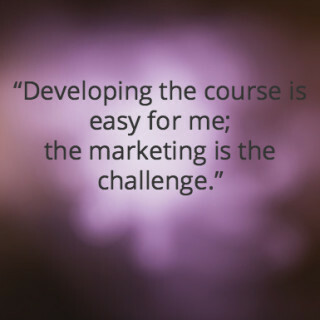 Let us know in the comments — do you find marketing to be challenging? And, did this post help you to look at the process a little bit differently? Is there anything from the post that you can apply this month? A good post about Marketing. Marketing is easy and fun. When you are authentic to yourself, it is easy to understand your audience. When you have clarity and awareness about yourself, it is easy to understand the needs of others. When you understand the needs of others, there is no need to bombard the customers with loads of emails. When you connect deep within yourself, you will be able to connect deeply with others. That is the best to way, you can make a difference in yourself and others. Thanks, Vetri! We agree – when you understand the needs of others, it makes things a whole lot easier for everyone. 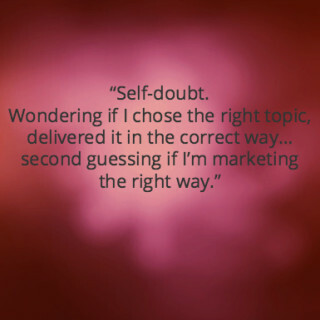 One of the struggles I have with marketing is – it can feel like I am blowing my own horn, and that doesn’t feel good. So, I am trying to put the audiences need or pain point first and go from there. Basically try and put myself in their shoes and stopping thinking about me. We’ll see how that goes.. thanks for another good post! Hi Susan! Yes, you are absolutely right to put the audience pain point first – it’s all about them, and what you can do to help them! Thanks for your insights. Marketing is a whole lot easier if you are already talking to people on a regular basis. The best advice I ever received (and acted on) was to write a weekly Email newsletter. And to just be me. That weekly hello in my readers’ inbox makes a world of difference when it comes to filling a class with eager students. Hi Shelly – thanks so much for sharing that tip. It’s great to hear that being authentic and just showing up for your audience does great things for class numbers! This is the best marketing advice I’ve ever read — EVER! 🙂 Yet one more thing to love about Ruzuku!